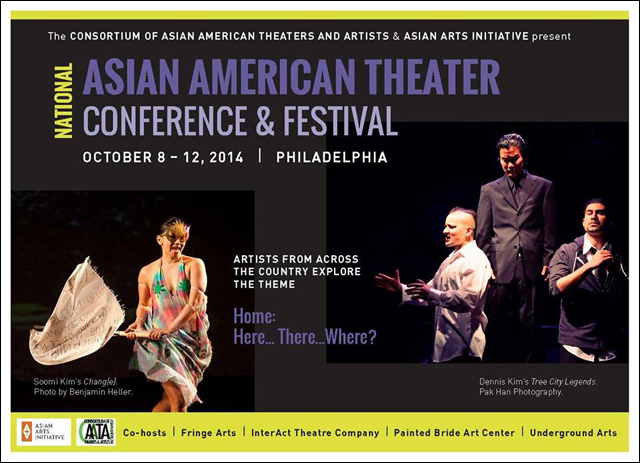 The 2014 National Asian American Theater Conference and Festival is taking place in Philadelphia this year, October 8th-12th, 2014! Through the lens of the Asian American experience of migration and the search for a sense of “place” and equity on personal, community, and global levels, the ConFest will examine Asian Americans’ relationship to broad definitions and meanings of home. Presented by the Consortium of Asian American Theaters and Artists (CAATA) and Asian Arts Initiative, the 2014 ConFest will be hosted at multiple arts venues throughout Philadelphia and will include 4 full-length productions, performance showcases, panel discussions, workshops, and plenary sessions. Open-mic opportunities, video presentation sessions with artists sharing work-in-progress, neighborhood artist/open studio and community tours, new play readings, and open space sessions will round out the program. For the full conference and festival schedule, click here. To purchase tickets, click here.